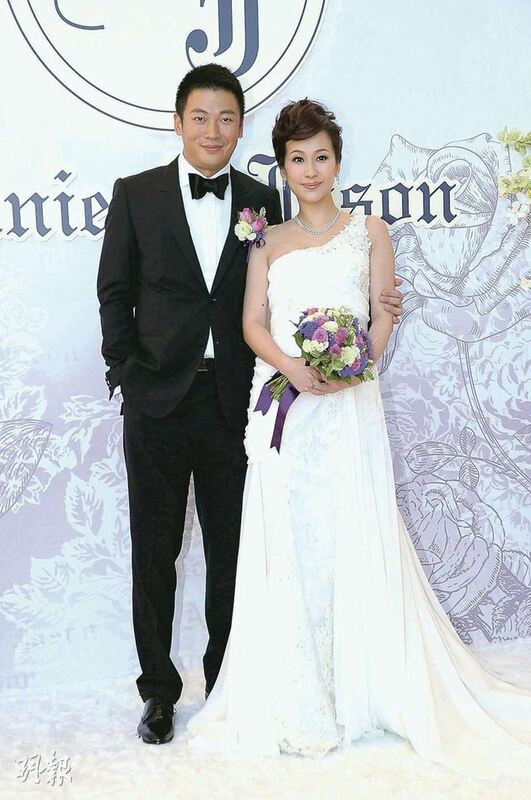 Hong Kong actress, Annie Man (文頌嫻) and businessman, Jason Lee (李梓慎), held their 28-table wedding banquet at the Four Seasons Hotel on March 2, 2012. Both 35 years old, the bride and groom had dated for 3 years. Appearing slightly more plump, the joyous bride announced that she was 3 months pregnant! The groom loved children, declaring that he hoped Annie will give him 5 kids! Due to her petite frame and long wedding gown, Annie wore 5 inch high heels yesterday, thus taking extra caution due to her pregnant state. The bridal party presided carefully over Annie, who drank tea instead of wine during the toast. Passing her first trimester of pregnancy and finally able to announce that she was expecting, Annie happily stated, “I’m very excited to share my pregnancy news with everyone! This is the best wedding gift, sent from Heaven!” Her husband, Jason, loved children dearly and would not have married her if Annie did not similarly dote on kids! The newlyweds will be heading to Southeast Asia for their honeymoon. Annie possessed many friends in the entertainment circle, in which her bridesmaids included Charmaine Sheh (佘詩曼) 、Angela Tong (湯盈盈)、Janet Chow (周家蔚), Margaret Chung (鍾麗淇) and Sherming Yiu (姚樂怡). The groomsmen included Chin Ka Lok ( 錢嘉樂) and Timmy Hung (洪天明). Janet Chow and Timmy Hung enjoyed the lively wedding yesterday. The couple’s own wedding was only a few weeks away, as it was scheduled in the end of March. Photographed vacationing in Singapore earlier, Angela Tong and Chin Ka Lok were accused by the media as taking their honeymoon. Despite earlier rumors that the couple were engaged and were planning a May 2012 wedding, Angela professed that Ka Lok had in fact not proposed yet. Angela explained that Chin Ka Lok was in Singapore for a work engagement, while she took the opportunity to enjoy the local attractions. Other wedding guests were Eric Tsang (曾志偉), Kenix Kwok (郭可盈), Frankie Lam (林文龍), Pinky Cheung (張文慈) and Alice Chan (陳煒). Jayne: Congratulations to Annie Man! Looking forward to see her little one then! Loved how Annie’s one-strap gown matched her bridesmaids’ silver dresses. WOW, I almost forgot that Annie’s wedding has taken place. Time really flies. Her dresses are nice and it is great that so many of her friends came. I wonder if she invited her friends that worked with her from ATV??? Alice Chan and Pinky Cheung were there at the wedding, and perhaps other ATV artists. btw – anyone know of good games to play when the groom comes pick up the bride? i’m the bridesmaid handling that event and i’m stumped!!!! huh? what do u mean to hope they have reconciled? i thought they are still married? they had some issues in the past. i know they never separated but they went through some rough times. i saw some of the pictures but i thought it was just for publicity. it looks more real in the picture above. then you haven’t seen other family pictures of them lately. they’re a lovely family. oh I see. I meant there are more pictures than that at their forum & they are lovely pictures with their daughter. I’m glad Annie didn’t choose the dress we saw in earlier news about her wedding preperations! Congrats to her and what a nice surprise to announce at her wedding. Marriage and kids, such a happy day. I don’t like the colour of the bridesmaids dresses though….Would’ve been nice if they were a brighter colour. Sorta dampens your mood when you look at them. I agree and am glad that she did not choose that one dress that we saw earlier. This one looks a lot better. I also did not like the color of the bridesmaid’s dresses. The style and everything is nice but the color looks a bit dull and depressing. Agree. I love this dress! I am sort of surprised that she announced her pregnancy as well. Does this mean it was a shotgun marriage? I thought people don’t like admitting to shotgun marriages… But then again, it’s probably hard to hide anyways. In another article, it mentioned that this is a shotgun wedding and that Annie and Jason spent 7 figures on it. Congratulations to Annie Man! =D Is it me or Charmaine Sheh has been the bridesmaid of many weddings already: Toby Leung’s, Annie Man’s and soon Sherming’s. I was wondering the same thing.. I heard that it is not good to be a bridesmaid too many times since you lessen your chances of being an actual bride. But that is just a myth so who knows if it is true or not. Ada Choi was a bridesmaid like 3 times before she got married and was a bridesmaid after she got married as well. I don’t think you are supposed to be a bridesmaid if you are already married though. Yes supposedly you can’t be a bridesmaid after you’re married but I think this more of a Western culture thing. They don’t seem to mind in Chinese culture…. Congratulations to Annie and Jason. I wouldn’t had noticed that she is three months pregnant. She looks really beautiful in that wedding dress. The top half of the bridesmaids’ dresses look really pretty but the bottom half look unflattering. So the next line up to get marry is finally Janet/Timmy and Sherming. I really hope Angela and Chin Ka Lok can just tie the knot. looks like Micheal Miu look-a-like. Or even Ron Ng look. i hope that’s a joke…..
bad choice in style and color for bridesmaids dresses. janet chow and margaret chung are the prettiest bridesmaids… everyone else looks really old esp with that off grey color. is kwan bo wai the same age as charmaine? cos they look like they’re around the same age. Congratz Annie n Jason! Hope their love is with each forever n live happily! the color of the bridesmaides are ok but her dress didnt really look that great on her. i dont no if she gained weight or whatever but she looks just ok.
Are you saying the bride just looks ok because of possible weight gain? Well I sure hope she did since she’s 3 months pregnant. Her looks are ordinary and acting skills are just fine. Her 3 months pregnancy does not seems obvious on the wedding day. Had to look really hard to remember who she is. I’ve seen her in many TVB series this photo puts her in a different angle… maybe her face has gone a bit rounder… I search on past photos and noticed she had a more V line jaw before. Anyway congrats to Annie and Jason. Congratulations, Annie and Jason. Glad that Annie chose a better wedding gown to suit her body. She looked a bit different with a round face. Perhaps it was due to the weight she gained because of pregnancy. She was brave to admit it at her wedding ceremony. I like the bridesmaids’ dresses as well. Though the colour was a bit dull, but it was very elegant in style. Agree that Charmaine looked the best among all the bridesmaids. She was the prettiest one, though not the youngest. I think the bridesmaids were the same people as in Toby Leung’s wedding. We may see them again in Janet Chow’s and Sherming Yiu’s.